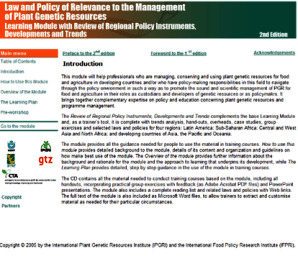 This module will help professionals who are managing, conserving and using plant genetic resources for food and agriculture in developing countries and/or who have policy-making responsibilities in this field to navigate through the policy environment in such a way as to promote the sound and scientific management of PGR for food and agriculture in their roles as custodians and developers of genetic resources or as policymakers. It brings together complementary expertise on policy and education concerning plant genetic resources and programme management. The Review of Regional Policy Instruments, Developments and Trends complements the base Learning Module and, as a trainer’s tool, it is complete with trends analysis, hand-outs, overheads, case studies, group exercises and selected laws and policies for four regions: Latin America; Sub-Saharan Africa; Central and West Asia and North Africa; and developing countries of Asia, the Pacific and Oceania. Click here for the new (2010) version of the training module on the International Treaty and the Standard Material Transfer Agreement which replaces Session 5 of this policy training module.